United Democratic Front (UDF) has reaffirmed that its president Atupele Muluzi is the party's torchbearer in the May 21 2019 Tripartite Elections with Frank Tumpale Mwenifumbo as his running mate dismissing "fake news" that he was withdrawing from the race to enter into electoral relationship with the governing Democratic Progressive Party (DPP). "Do not be misled. Atupele Muluzi will not withdraw his presidential candidature. Atupele is focused and resolute to contests this elections," Mbewe said. "These speculations have been going on for a long time. There were speculations before presentation of nomination papers and now more propaganda. "Let me assure each and every supporter of our party that Atupele is contesting as president. Without a shadow of a doubt I see no reason why he should withdraw," Mbewe said. UDF director of elections Clement Stambuli said the country needs a visionary leader who can transform rural people's lives, pledging that once voted into power; Atupele Muluzi will put in place programmes aimed at uplifting living standards of rural masses. "UDF is well prepared and we are prepared to fight this election to win," said Stambuli. "What we are promising people is that we as UDF have a track record where we have done good things in the past, developments in the villages through institutions such as Masaf. We are going to bring back Masaf to its original entity," said Stambuli. Muluzi who is serving as Minister of Health in President Peter Mutharika's Cabinet since 2014, supporting the DPP. But UDF says this is all "propaganda!" as Muluzi is scheduled to launch party manifesto and roll out campaign. Ernest Thindwa, a political analyst based at the University of Malawi's Chancellor College, expressed scepticism on Muluzi's commitment to the presidential bid when he is in the Cabinet of a President he is seeking to unseat. Muluzi was drafted into Mutharika's Cabinet in 2014 and has served in several portifolios. 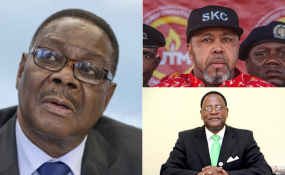 His UDF entered into a parliamentary working relationship with DPP and in the run-up to the presentation of presidential election nomination papers, it was widely speculated that he would be Mutharika's running mate. UDF spokesperson Ken Ndanga insisted Atupele Muluzi would contest in the elections and usher in the "new beginning".